I am… not a Sean Hannity fan. The impression I've gotten from our few Twitter interactions is that the feeling is mutual. But even Hannity doesn't deserve to be badly taken out of context and smeared. That's what happened late Wednesday, when a partisan twisted his words to accuse him of calling on witnesses to illegally destroy evidence. 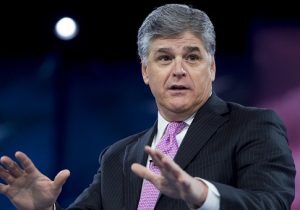 In a tweet from Media Matters for America's Andrew Lawrence, the senior researcher claimed that, "Tonight Hannity is freaking out about Mueller searching encrypted apps and ‘advised' all Mueller witnesses to ‘bash' their phones ‘into itsy bitsy pieces.'" As of this writing, the tweet has thousands of retweets, has been widely shared by reporters and fellow liberals, and has prompted stories in Rolling Stone, Mediaite, Daily Beast, Business Insider, The Hill, and Newsweek. Hey remember when Assange DM'd Hannity asking him to reach out on an encrypted app? Too bad it's a complete lie. Here's the official transcript of Hannity's actual remarks. The bolded part is what Lawrence left off in his clip. HANNITY: This is interesting—they are demanding that witnesses turn in their phones so team Mueller and, of course, his pit bull Andrew Weissmann and Jeannie Rhee, who worked for Clinton, get to review all of their electronic communications. He wants the phones turned over even texts that are on what are called encrypted apps like WhatsApp or Signal or one of these things. Maybe Mueller's witnesses, I don't know. If I advise them to follow Hillary Clinton's lead, delete all your emails and then acid-wash the emails and hard drives on the new phones, then take your phones and bash them with a hammer into little itsy-bitsy pieces, use BleachBit, remove the SIM cards, and then take the pieces and hand it over to Robert Mueller and say, ‘Hillary Rodham Clinton, this is equal justice under the law,' how do you think that would work out for everybody who Mueller is demanding their phones of tonight? I'm certain the result would not be the same as Hillary's. Now purely by coincidence, it seems like the part that Lawrence left off completely changes the tenor of Hannity's remarks. Hannity is in no way saying that those under the Mueller investigation should destroy their phones. In fact, he's saying the exact opposite, that unlike Hillary Clinton, they'd face serious legal consequences. HANNITY: Mueller wants everyone's cell phones. My advice to them, not really, kidding, bad advice would be, follow, Hillary [sic], you know, lead. FOX NEWS CONTRIBUTOR SARA CARTER: Absolutely. FOX NEWS LEGAL ANALYST GREGG JARRETT: Yes. HANNITY: To lead them acid wash them, bust them out and take out the SIM cards and here little pieces, here Mr. Mueller, here, I'm following Hillary's lead. HANNITY: And as I said, now that Robert Mueller wants everybody's phones in case they used one of these applications I guess, you know, WhatsApp, or whatever you call this stuff, so he wants all this information and interestingly, he wants it and I wonder if everybody that has phones if they did when Hillary did and that's delete the emails, delete the app, acid-washed the phone, break it up to the little bits and take the SIM cards out, how would that work out for all the people Robert Mueller's requesting phones from? DIGENOVA: If they have done any of those steps that you just identified, they would have obstructed justice and we would be subject to prosecution. Lawrence eventually tweeted out video of the second exchange, in which Hannity said he was joking. It got six hundred retweets, compared to the original's six thousand. I mean, it's clear as crystal. Sean Hannity didn't call on witnesses to destroy evidence. You're welcome to think his "What about Hillary" rhetoric is tired or lame, but the notion that he's guilty of calling for a felony in earnest is just wrong.